Home theater is hot today. And "invisible" home theater is even hotter. But until now, it was nearly impossible to experience the full on high performance of traditional loudspeakers using "hidden" in-wall and in-ceiling speakers. Now, Definitive Technology would like to introduce you to the "stealth" sound system solution: Definitive Architectural Loudspeakers. These reference-quality loudspeakers deliver superb sound in unusual in-wall and in-ceiling installations for high end home or commercial applications: anywhere you want warm, rich, traditional performance without the cabinet-style traditional speaker! In-Wall and In-Ceiling installations deliver Definitive's smooth natural sound, reproduced with a lifelike, three-dimensional character that really brings music and movies to life, perfecting the illusion that the music or cinematic action is actually being performed live in your home! This ability to encourage your suspension of disbelief is the hallmark of a truly successful "hidden" loudspeaker. Build a "stealth" home theater system that will blow you away without taking up any shelf or floor space! Easy-to-Install--One hole, no mess. Precision templates are included. Exclusive Locking Arm Mounting System grabs your wall with high tension clamps at the turn of a screw, stiffening the baffle and eliminating resonance! (Rough-In Kits for new construction are available, too.) Easy to paint so they virtually disappear into your room, and moisture-resistant for kitchen and even bathroom installations! Pure Aluminum Dome Tweeters--Exclusive, Definitive-developed Magnetic Fluid-Cooled Moving-Coil Tweeter Dome of Pure Aluminum synergistically brings together the performance advantages of metal domes (greater clarity) and soft domes (smoother sound and better dampening) in one state-of-the-art tweeter design, for detail, clarity and accurate imaging. High-Definition Cast-Basket Bass/Midrange Drivers--For significant performance advantages in the areas of bass reproduction, lifelike midrange clarity and dynamic range. (All models except UIW 63/A and UIW 83/A.) Aerodynamically designed, magnetically inert, non-resonant cast baskets minimize reflections of the sound radiating from the back of the cones and preserve structural and magnetic integrity. 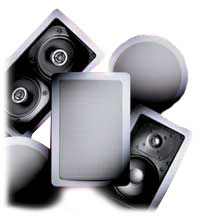 Rigid Non-Resonant Glass-Filled Low Profile Frames--Maintain sonic purity by defeating diffraction, giving Definitive Architectural Loudspeakers a wide, dynamic sound stage with minimized resonance or coloration. Molded of a glass-filled polymer compound to eliminate baffle resonance. Definitive Technology Architectural Loudspeakers come in a wide array of round, rectangular, bipolar, dual-channel and all-weather styles to suit any installation need. They are all engineered to achieve the same level of superior sonic performance as our flagship floor-standing speakers, utilizing the same state-of-the-art components and technologies developed for our top-of-the-line speakers. So you can mix-and-match these in-wall and in-ceiling loudspeakers in systems with other Definitive Technology loudspeakers.